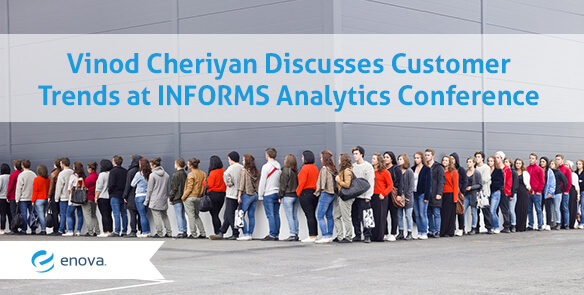 Pricing Product Versions for Strategic Impatient Customers - Enova International, Inc.
Vinod Cheriyan spoke at the INFORMS Annual Meeting 2014 on Business Analytics and Operations Research, addressing the issue of product-pricing based on consumer impatience. This blog post distills the details of that talk. The super-long lines in front of Apple stores the night before the launch of a new iPhone are no longer a novelty. For the most recent launch, the line in front of the flagship store in New York stretched 12 city blocks.1 This kind of customer behavior points to a specific kind of impatience. Exactly the same iPhone can be purchased at the same price a week later, without having to stand in the long line. However, that does not give customers the bragging rights of owning the latest version, or even of having stood in the line. Thus, the conventional notion of utility — that only considers the use or revenue from a good — needs to be updated when pricing products for such customers. IPhone customers know that Apple comes out with newer versions fairly regularly. Many customers take into consideration the anticipated features on the next version before making a buying decision — especially if the next release date is reasonably close. Thus, they act strategically. This raises a question to the manufacturers: How should they price the products optimally when their customer base is impatient and thinks strategically? There are many ways to answer this question. One could do a market study to see how customers respond to price changes. One could do simulations. One could look at what other major players have done before. One could develop a theoretical model. While each of these approaches (and many others) has advantages and disadvantages, in this article I will consider the last two approaches. It looks like Apple follows a fixed pricing strategy; they offer the same introductory price with every new version of the iPad. There are no price discounts later in the product cycle. On the other hand, look at the pricing strategy for Amazon Kindles. Though Kindle 1 was offered at a single price, Kindle 2 was offered at successive discounted prices during the product cycle. 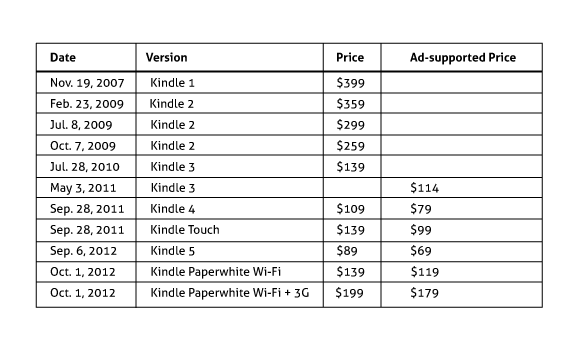 From Kindle 4 onwards, Amazon changed its pricing strategy — a lower-priced, ad-supported version was offered alongside a full-priced version. From these two examples, it seems that some simple theoretical modeling can help shed some light on the situation. At the outset, let me acknowledge that the theoretical models have their limitations. Customers tend not to behave exactly like the equations we use to model them. The models are typically very stylized, and include a number of assumptions. Despite all these drawbacks, we still use modeling because if a model captures the essential features of the system we want to study, it can provide useful managerial and operational insights into the system. Thus, we make a simplified model of customer behavior to help us determine when it is optimal to offer price discounts during the product cycle. We consider a monopolist firm that introduces new versions of a consumer product regularly in the market. To simplify the algebra we assume that the product lives only for two cycles. (E.g., after iPhone 6 has come out, iPhone 4 is too old and people will stop using it.) Each product cycle has two price periods — the product is offered at full price at the beginning of period 1, and at the beginning of period 2, the product is offered at a discounted price. Each cycle the quality improvement of the new product over the previous version is the same. Thus, with appropriate scaling, this setup gives rise to an “infinite horizon” of repeating product cycles. This means that the two decisions that the firm needs to make in our stylized model are the two prices — the original price in the first period of the cycle, and the discounted price in the second period of the cycle. Customers are strategic and impatient and have full knowledge of the firm’s strategy. (While this is an oversimplification, we assume that the customers have a fairly reasonable idea of strategy — from technology gossip, or press conferences, or just previous history.) Each cycle they can choose whether to buy a new version, keep the current version (if they have the previous version) or do nothing at all. Note that the decision of a new customer (a customer with no product or one whose product is expired) can differ from that of an existing customer (a customer who already has a version of the product). How do we model the customer’s impatience? We use a simple model, that in the first period the customer derives some extra product utility based on an impatience factor θ, that can range between 0 and 1. If u is the utility of the product in period 1, a customer with impatience θ will derive utility equal to (1 + θ)u. Why only in the first period? Because if you are buying the product in the second period, we assume it is too late to derive any bragging rights. Given this setup, one can create a model of the customer’s long-run discounted utility. Since there are two classes of customers (“new” and “existing”), there are two sets of utility functions. These equations are called Bellman equations. The interested reader can refer to this topic. The Bellman equations can be solved to obtain the optimal actions (buy, keep, do nothing) of the two customer classes given the firm’s prices. Now comes the firm’s turn to decide on period 1 and period 2 prices. Simply put, the firm picks these prices to maximize its long-run discounted profit. As an aside: We had to make a number of assumptions and simplify the setup to enable us to solve these equations. We can obtain closed-form solutions to the customer’s and firm’s decision problems. This is especially useful, as now we can do some analysis and derive managerial insights. So what does the model tell us about customer’s behavior and firm’s prices? First, as expected, the optimal behavior of the customers is segmented based on their impatience. Customers with the highest level of impatience would buy a new product every cycle. Those with slightly less impatience would buy every other cycle. Customers with very low impatience would exit the market. Of course, the number of customers who choose these actions (called “customer segments”) depends on the prices offered by the firm. What does it tell us about offering price discounts? In our simplified model, and along with some numerical simulations to support it, it turns out that if the cost of production is small, it is optimal for the firm to offer price discounts (the Kindle strategy). This entices the fence-sitters to buy in the current period. If the cost of production is large, the optimal strategy for the firm includes not offering any price discounts (the Apple strategy). Of course, these are general insights drawn within the assumptions of the model. An actual implementation of a pricing strategy will be more complex. For example, the firm can offer trade-in prices for existing customers. The firm can also offer refurbished products. These factors and more must be taken into consideration in a realistic setting.